Alan is getting bigger and bigger. 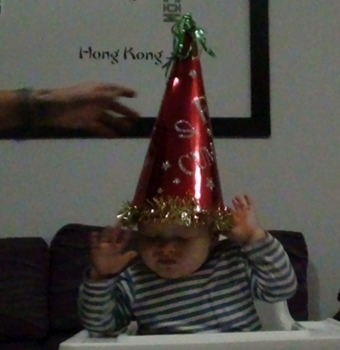 He is already one year and that called for a celebration with cake, presents and lots of attention for little Alan. His first year passed fast. He is already almost walking and is crawling through the house at record speeds. He has learned to point at things he wants and he laughs when he acts as if he want to give you something and when you try to take it he will quickly take it away for your grasp. The difference between our two kids are physically not so big. They look very similar but the difference in character could not be bigger. Alan is stubborn, does only what he wants to do, and convincing him to do something takes a lot of effort. With Alex this was a lot easier. Alex never put his finger in a wall-socket, but Alan went straight for the wall-socket at the moment he could crawl just to put his finger in.